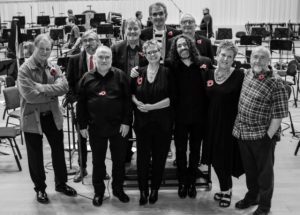 Here’s a link to last week’s live broadcast of the Ballads of The Great War, featuring the BBC Philharmonic Orchestra – https://www.bbc.co.uk/programmes/m0001242 – five of Jez’s songs were featured, and he sand lead on two of them. It was an amazing programme…. Since then, Jez has been on the road across the UK with the Ballads of Child Migration tour. It’s been another successful, much-praised tour. Copies of the original album, featuring four of Jez’s songs (all of which were included in the stage version), are now available again by mail-order from this website… Jez is back with Steve Tilston next weekend, and then the Bad Pennies’ Christmas Tour, entitled “Thor’d Out!” begins on November 30th… The photo here is by Phil Carter and is from the BBC Studio in Salford on November 9th. 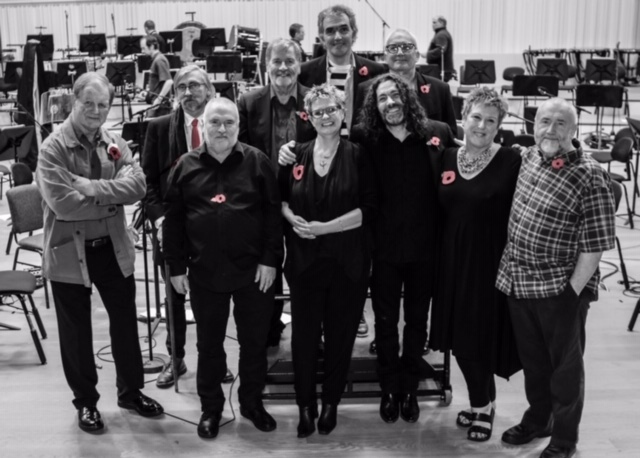 Left to right – Michael Morpurgo, John Tams, Jim Boyes, John Leonard, Julie Matthews, Jez Lowe, Greg Lawson, Chris While and Bob Fox.